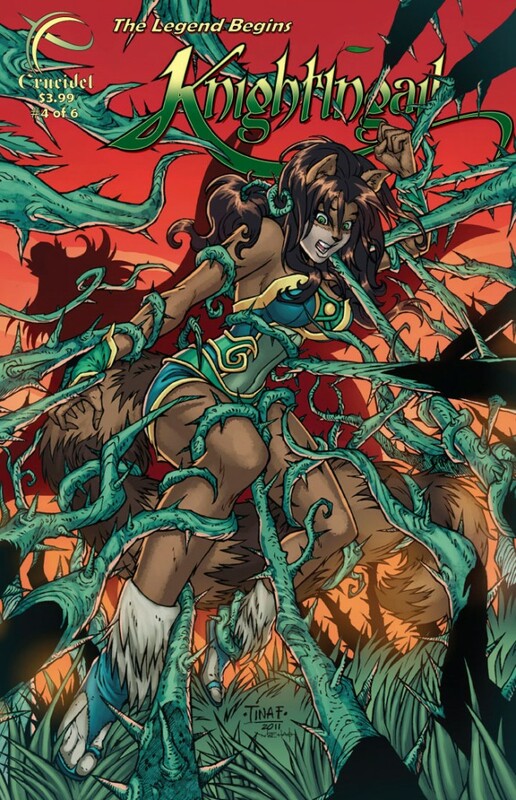 Another new discovery from WonderCon: “Knightingail: The Legend Begins is a 6-issue fantasy, adventure mini-series that tells the story of how a Forester, teenage princess named Eloa is transformed into a mystical powered warrior princess named Knightingail. Knightingail has the ability to control the forces of nature and heal living creatures. She must re-unite the 7-tribes of her homeland to fight off a massive invasion force.” Those 7 tribes include various anthropomorphic species as well — check out the character of Kaeli Hunter from the cover of issue #4, below! The series is created written, and published by Wayne Gardiner and penciled by Tina Francisco. Various artists helped out with the inking, coloring, and covers. You can find out more about all of this (including a new package offer for the whole 6-issue series) at the Knightingail web site, hosted by Knightingail herself.